Batribike is an associate member of the APPCG (All Party Parliamentary Cycling Group). Members are from both the Commons and the Lords who are passionate about cycling and facilitating more people to do it. I was please to be able to attend the meeting yesterday that was chaired by Ruth Cadbury. 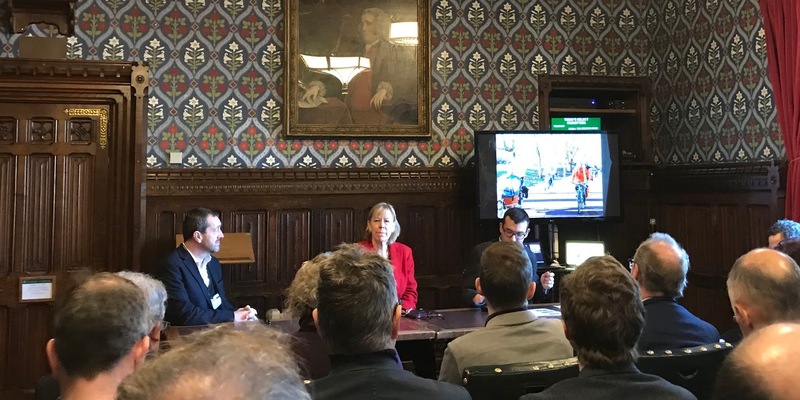 The speakers were Will Norman who is the first Walking and Cycling Commissioner for London, and Chris Boardman the first Walking and Cycling Commissioner for Greater Manchester. Both are committed to get more people cycling and walking and to create the space in our cities for that to happen. Whilst the meeting focussed on these two major cities I firmly believe that there is a ripple effect. When good things happen in major cities other parts of the country sit up and notice, they start to think that this could happen in their location too. London is ahead of Manchester with many new routes already in place and Manchester is just starting its journey, however, with an innovative way of looking at change I think things could move ahead in Manchester very quickly, and that’s good for all of us. Will Norman spoke about doubling the number of cyclists in London by 2014, he said that it is not just about creating routes, it is about the quality of the route, how easy it is to use, and about people wanting to use it. It is important to improve Active Travel because for the first time in human history life expectancy has fallen. Five year olds today have had their life expectancy cut by five years! In London 9 million people are dying earlier because of air quality. On the positive side, active travel means more foot fall past small businesses. Customers have the chance to stop and browse or buy. Will said that it was important to have a serious monitoring system, collecting data of this sort is important to proving the benefits. Good way marking to help people complete their journeys is crucial and TfL is looking at ways to improve this. He is looking at ways to have better bike parking in shopping and work areas. 250 million car journeys in Greater Manchester are less than one mile! What a statistic, but also a great place to start. Chris said that they have planned for success by getting all the individual boroughs to say where cycling and walking routes are blocked or cut of by obstructions such as major roads or canals. In this way they can look at safe crossing points and connections. What a great way to start, already the individual boroughs are committed to the project. He wants to have way finding with a guarantee of quality. If it is waymarked you can be sure of the quality of the route to ride or push a double buggy. He asked that planners imagine a competent 12 year old cyclist, that is who they should be aiming junctions at. If they or the child’s parent could be confident in them using that junction then it was good enough. Greater Manchester is planning to create 144 new or upgraded crossings, 26 miles of new routes and 9 miles of Dutch style segregated cycle routes. Overall I thought it was a very positive and encouraging meeting. If other cities can take on this idea of looking at where routes are blocked or cut off and improving these connections then a better network for cycling and walking could be created countrywide.